You and your little one will love this sippy! Easy to drink, easy to hold, easy to clean - and water, milk or juice will stay cold for hours. The Insulated Sippy is made with two layers of vacuum sealed #304 food grade stainless steel – no BPA, no phthalates, no liner. The bottle has only a few parts, with an integrated handle and neck that accommodates a ring and Avent spout. We’ve done our best to offer a simple, yet colorful sippy that will not leak with ordinary use and will make your hectic life easier. 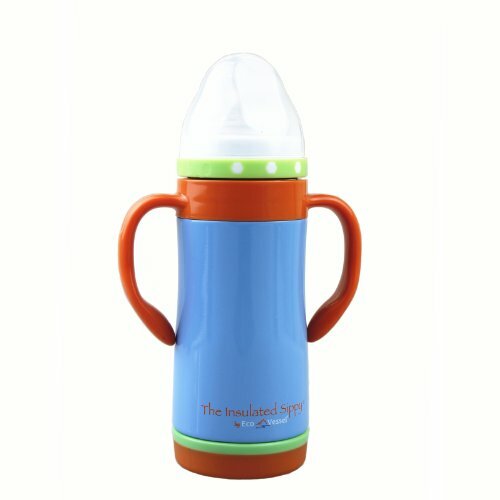 TIS295HB Color: Hudson Blue Features: -Thermos bottle.-Material: Insulated stainless steel.-"The Triple Insulated Sippy Cup" thermos bottle.-Made with two layers of vacuum sealed #304 stainless steel.-Easy to drink, hold and clean.-Integrated handles.-Accommodates a ring and Avent spout.-Does not contains BPA, phthalates and liners.-Food grade quality.-Capacity: 10 Ounce. Dimensions: -Overall dimensions: 7.5" H x 2.5" W x 2.5" D.